The Southwest Agility Team (SWAT) is a not-for-profit club devoted exclusively to the sport of dog agility. Its objectives are to encourage competition at dog agility trials and to conduct licensed dog agility events. SWAT organizes 7 licensed agility trials and hosts one agility fun match per year. The club organizes and delivers 2 AKC trials (in partnership with the Weimaraner Club of Albuquerque), 3 USDAA trials, and 2 NADAC trials. 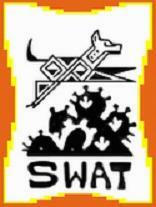 SWAT hosts a fun match during the summer months. All events are currently held in New Mexico.